Art Gallery Frames features hundreds of art frames online for artists and art lovers. Our art picture frames come in the most popular styles like Baroque frames, large art frames and painting frames and are designed to feature paintings, drawings, photography, and other works of art. 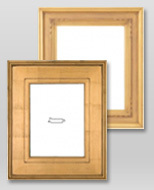 The point of our frames is to complement the artwork it holds, rather than take the spotlight. We offer a variety of sizes, colors, and styles to best suit your needs and taste.